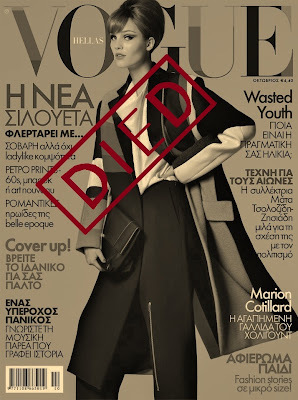 Rebel Visionaire: VOGUE HELLAS Died. It was a week ago when I first heard that my favorite Starbucks store closed, and then it was a few days after that, that Conde Nast decided to shut down Vogue Homme Japan, introducing GQ men worldwide. Two of my favorite things in life just ended. Without second thoughts. And then 2 days ago while watching TV I heard that Lyberis Publications are closing for good due to the economic crisis. Now for those who don't know anything about the company, Lyberis Publications is one of the most important ones if not the most important due to its cooperation with Conde Nast for Greek magazine franchises such as Vogue, Glamour and Men's health. Meaning a great deal of death for the fashion press in Greece. It came as a shock to me not because it was unexpected, but because as a fashionista, I am afraid that Greek fashion will die in the end in an absolute level,making it really hard for me and the rest people of the industry to make it, due to the lack of job opportunities. 500 people suddenly got “kicked out”, but fortunately some of them got absorbed by several fashion magazines that are still standing . Hopefully the end of Vogue Hellas is not quite sure yet, although its running under the umbrella of Lyberis Publications is. That's because right now, as we speak, Conde Nest is going under serious consideration of the terms that the titles of Vogue Hellas will be transferred to other publications. In my opinion it's bad management that led as to this situation, as it is really greedy for a company to run so many things at one time, and maybe the 90s were heaven like for the world of enterprises but someone always has to be perspicacious as history taught us that no era of wealth and well being lasted for too long. So let's hope for the best, as it will be a huge sight of relief for everyone if Vogue makes it in the end.